Dawn Sears was one of the first women in Country music who swam into my consciousness once I was old enough to realize what an art form this genre truly is. From the first time I heard her croon Leaving and Saying Goodbye in that classic rasp that matched the likes of Patsy Cline and Loretta Lynn, I knew she would be an artist I wouldn’t soon forget. I was blessed to see Sears in concert with The Time Jumpers and Vince Gill shortly before her death, and that too will be a show that stays with me for the rest of my days. Sears captured the casual magic of country in everything she did; the way she posed at the microphone, every flick of her wrist, her magical harmonies and lead vocals. She was the walking definition of country western music. 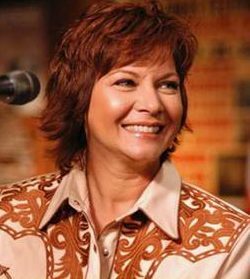 Born on December 7, 1961, Sears wasted no time in her young life to get started in country music. Formally beginning her career at 29 with Warner Bros. Records, Dawn released her first album titled What a Woman Wants to Hear. 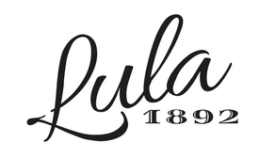 Not long after releasing her album, she decided to leave the country music industry. 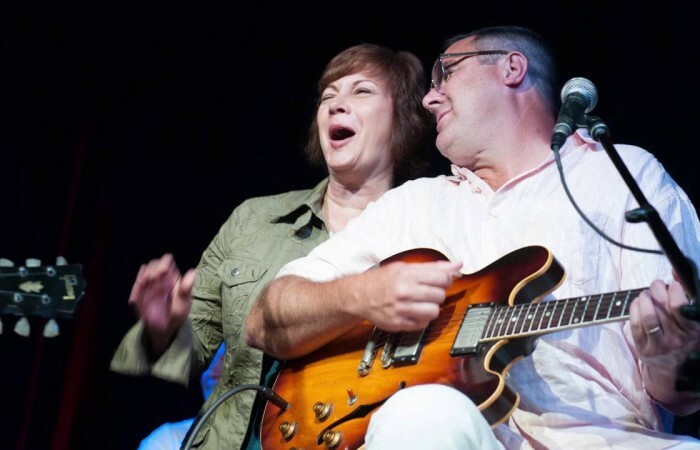 We have Vince Gill to thank for enticing Dawn and her angelic voice back to the honky tonk side of things- after hearing her sing, he called her and asked her to join his road band. Sears toured with Gill off and on throughout the rest of her career and provided harmony vocals on several of his albums, including I Still Believe in You and Next Big Thing. Gill’s albums aside, Sears left a lasting legacy with the Time Jumpers, a group of top-notch, in demand studio musicians who originally got together in 1998 so they could spend some time jamming together. The Time Jumpers rose to a far more famous stature than they intended on, faster than they could have ever imagined. Originally housed by the Station Inn on Monday nights, The Time Jumpers eventually moved venues to 3rd & Lindsley to accommodate their ever growing audiences. 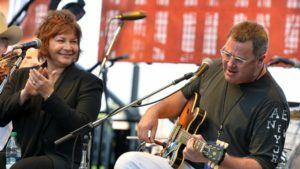 The Time Jumpers is currently comprised of ten musicians – Dawn was the eleventh before she passed away in Gallatin, Tennessee in 2014, just after her 53rd birthday. The current Time Jumpers band members are: “Ranger Doug” Green (vocals, acoustic rhythm guitar), Paul Franklin (steel guitar), Brad Albin (upright bass), Billy Thomas (drums, vocals), Kenny Sears (vocals, fiddle), Larry Franklin (fiddle), Andy Reiss(electric guitar), Jeff Taylor (accordion, piano), Joe Spivey (fiddle, vocals) and Vince Gill (vocals, electric and acoustic guitars). The Time Jumpers have been dropped in on by big names in the industry in the last nineteen years; some to play along, some to enjoy their eclectic mix of musical offerings. A few of their most famous fans are Bonnie Raitt, Reba McEntire, Robert Plant, Kelly Clarkson, Kings of Leon, and Jimmy Buffet. Together with a menagerie of guest artists, the Time Jumpers create magic, and their classic country sound is one to revel in if the opportunity ever presents itself. My name is Dawn Sears. I am on a mission to help fund lung cancer research at Vanderbilt (by way of a benefit concert), which will bring more HOPE to those of us with lung cancer. I was diagnosed in Feb. 2013. Both sides of my family have experienced cancer so it’s not all that unfamiliar, however, now with lung cancer I have a greater understanding of the daily battle and challenges that people with cancer (of any kind) face [Dawn Sears, Dawn Sears and Friends Benefit Concert]. With the help of her talented and compassionate friends, Dawn Sears and Friends raised over $100,000 for cancer research at Vanderbilt that night. The only thing that could match Dawn Sears’ talent was her compassion. Though moves throughout her career were met with varying success, there was one thing no one could deny Sears; when she sang, people listened with rapt attention. One of the most powerful moments I’ve had the luxury of experiencing was sitting in an old theatre, a few rows back from the stage, hearing Dawn open her mouth for the first time. There is a rich intimacy to her music, and a warmth that cannot be duplicated. To know of her is to adore her, and Dawn will always be an artist we love. To learn more about the Time Jumpers, please visit their website. There you can find show dates, album information, and what they’re up to next. If you are interested in donating to the Vanderbilt-Ingram Cancer Center, please visit their website. Don’t Miss the Encore Presentation of CMA Country Christmas!